I call this blog pushing copper because that's mostly what I do in my work. I push metal around with hammers, punches, stakes, pliers, my fingers, anything that will do the work of shaping the piece from its original form into the form I want. Metal is plastic, like clay. Really stiff clay, but still plastic. Hit it and it deforms. It bends, squishes, thins or thickens, all depending on the direction of the force applied. The tools just make it possible to apply that force in the desired direction and location. Iron and steel are cheap and readily available. But they have to be heated to make them soft enough to work by hand. 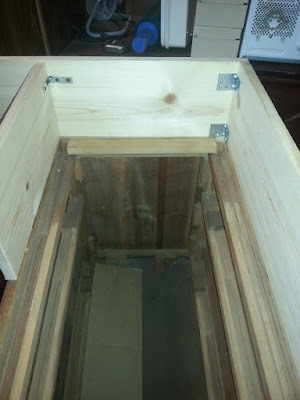 That adds a level of difficulty to the task; you have to be able to hold the work as well as the tools and you can't get too close or you risk getting burned. Silver and gold can be worked by hand at room temperature. That's an advantage. You can hold onto your work and get very close to it. Or you can fix it into something like wax or pitch. That leaves both hands free to hold the tools for shaping the metal. But precious metals are expensive. That makes mistakes expensive. Copper and its alloys are a wonderful compromise. They are relatively inexpensive and they can be worked at room temperature. Copper, brass, and bronze have beautiful warm colors and can take a wide range of patinas. Copper is particularly malleable. It works easily under the hammer and the experience of shaping it is relaxing, almost meditative. Copper is also the first functional metal that humans learned to work, around 11,000 years ago. It can be found in native form, as metal not ore, so early humans learned the uses of metal before they learned how to smelt it. Silver and gold can also be found this way, but they are rare and are too soft to make functional use of. Around the same time that humans began cultivating crops, some 9,500 years ago, they learned how to smelt copper from its ore. Humanity was on its way to civilization. The work I do in copper and copper alloys is based on the tools and techniques learned in this deep history. It gives me a sense of connection to the artisans of the past; knowing that they would recognize much of what I do as their craft. Copper is one of the seven ancient metals: gold, silver, copper, tin, iron, lead, and mercury. The ancients associated each of them with a deity and a bright feature in the sky. The names and sometimes the genders change depending on the culture. Of the seven, only one was always female: Copper, the Queen of metals. 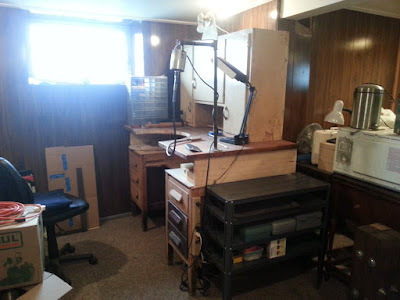 The first thing I need is a jewelers bench and I devoted this week to getting that done. Here's how the build went. 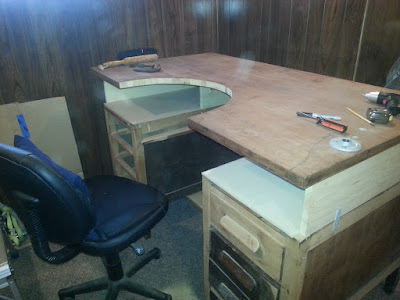 This is the desk that I had been using for a bench in the old studio. 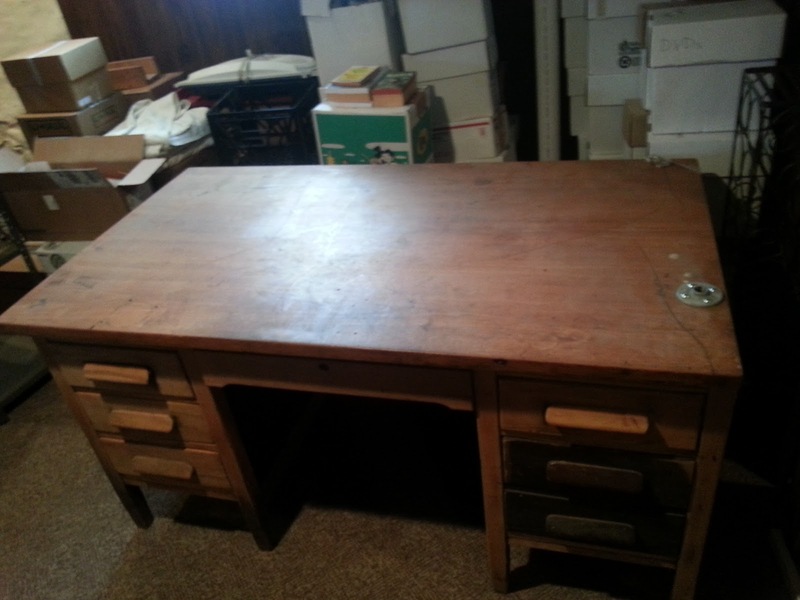 Big old school desk. The floor flange is where I had a flex-shaft hanger mounted. Brian Meek posted the original Frankenbench instructions that I'm following. The top will be raised 8 inches. That should put it just about armpit level when I'm seated. Since I've never used a European style bench (and only occasionally used a real bench of any kind) I'm waiting until I'm into the build before deciding what shape it should be. Here's the desk with the top off. Top off and innards exposed. 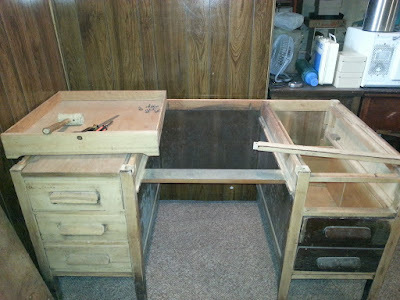 The center drawer will become a tool and sweeps drawer. 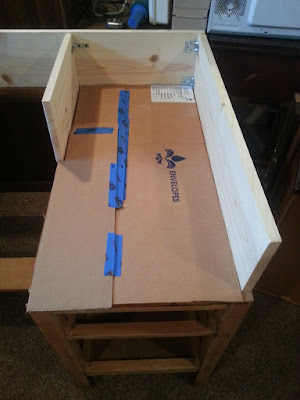 Sun 29 May 2016 - I've been to the hardware store and gotten lumber for the bench risers and the drawer stack tops as well as the hardware I'll need to build and attach the risers. While there I also picked up the lumber for the power tool benches that I'll need to build after this. 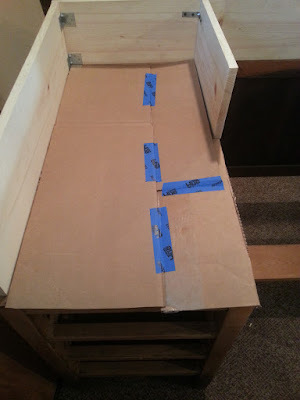 Mon 30 May 2016 - Today I'm getting started on the Frankenbench. 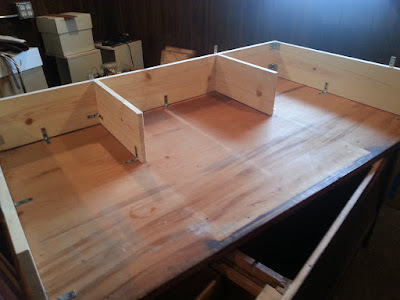 I pulled the top off the desk so that I could measure, cut and fit risers to lift the top to the correct height. There were some fixes that needed to be done before anything else could be done. There were two braces that spanned the center of the desk. They had to go because they would interfere with the open space needed to access the bench pin. Out they went. First one gone and the second to follow shortly. I then added a foot brace to strengthen the bench since the other two braces across the center space had to be removed. Left connects to right again. Had to lay the desk on its back to get this screwed into place. 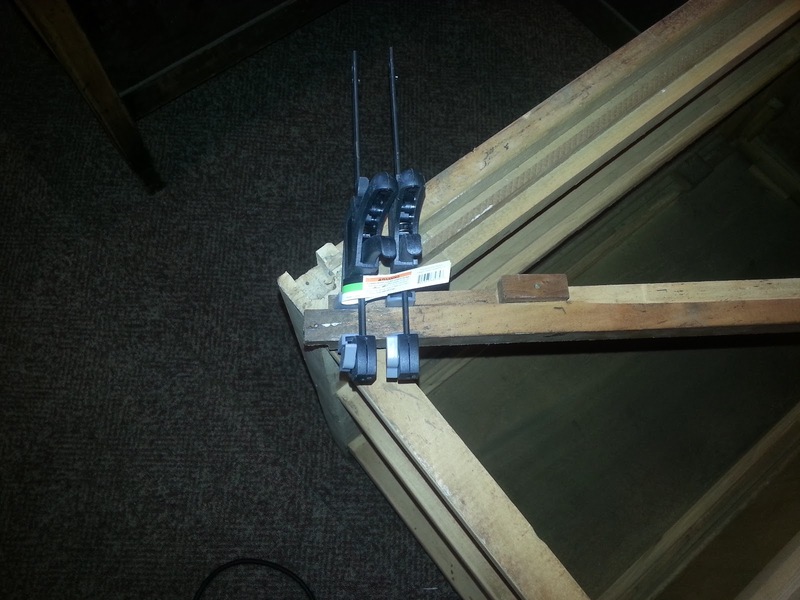 The center drawer guide rails needed some repair. They'd been abused and needed to be glued back to solidity. Using the strap plates I got the sides and back connected to the bench body. Then they got attached to each other with heavy corner braces. 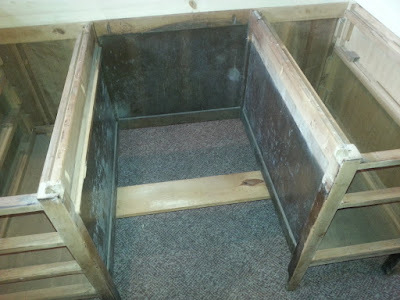 Finally I connected the two interior short walls to the back riser. 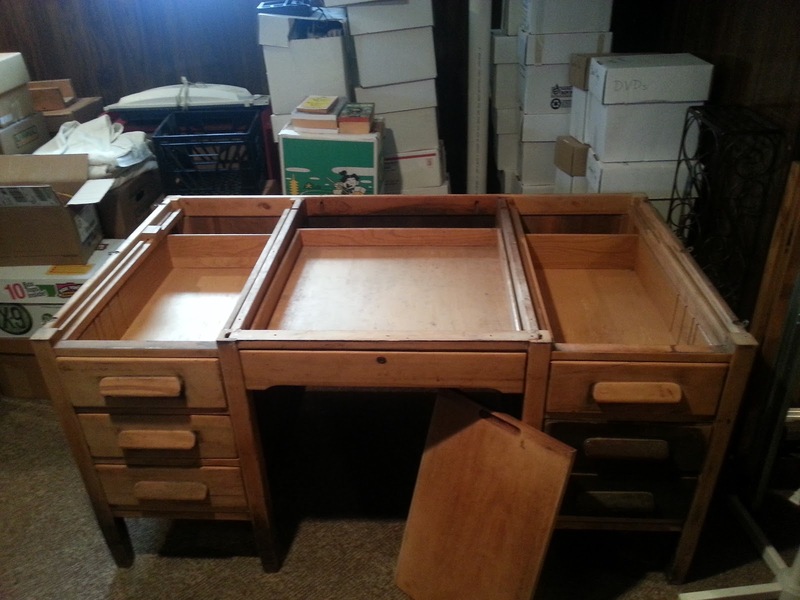 It's ready to attach the top after the drawer stacks are capped off. I'll want a light under the counter and a power strip. And I'd like to cut down the center drawer for a tool drawer and add a sweeps pan. I still haven't decided what shape to make the bench pin opening. Tue 31 May 2016 - Today's task was getting the drawer stacks covered. That was a fiddly job because of the shape left by the interior short walls. So I made a cardboard template before cutting the MDF. Cardboard template for the right side. Fits the other side when turned over. 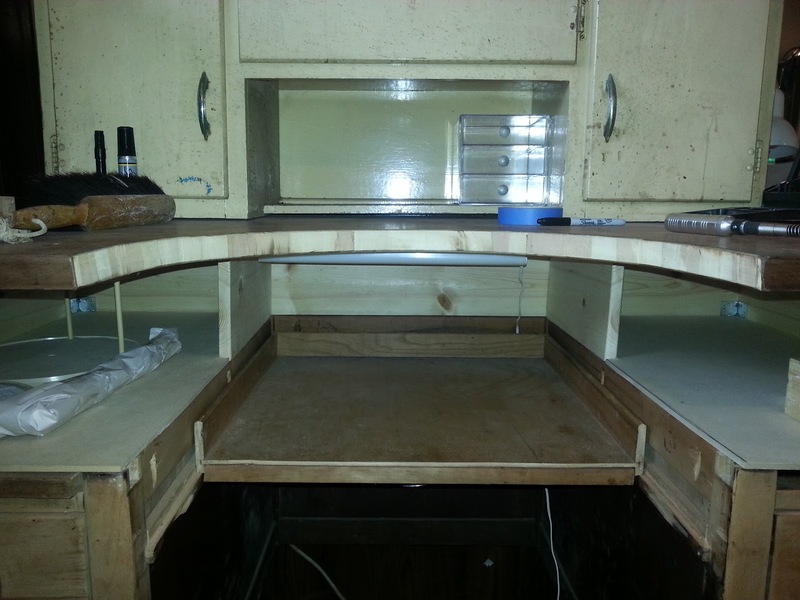 The MDF was fussy but I managed to get a reasonably tight fit. 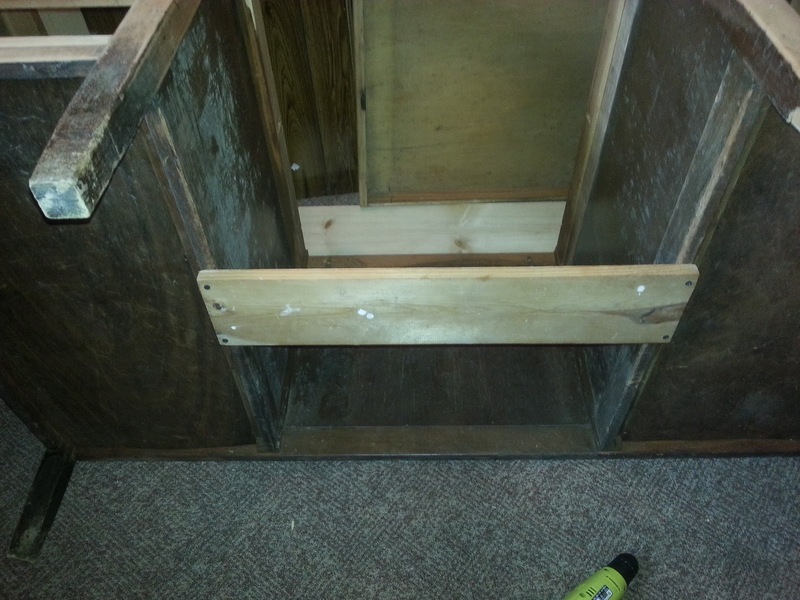 This side needed a support glued in at the back. There were other things to do today so I only got a couple of hours in. Tomorrow should be more productive. Wed 1 Jun 2016 - Got a lot done today. The bench top is secured to the risers and the body of the bench. And now it's almost too heavy for me to lift. I cut a semi-circle out of the top for the main opening. That took about an hour of jigsawing. This is a solid wood desktop. Looks like a jeweler's bench now. 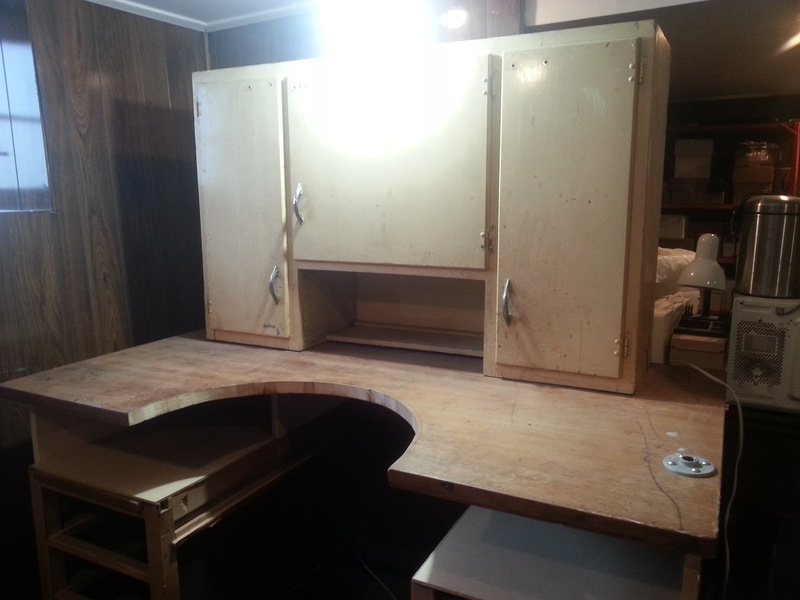 Against my expectations the cabinet that used to fit on my old hot-work bench fits on top of the raised bench top. I'd been worried that the ceiling might not be quite high enough. It fits! I have on-bench storage. At this point the bench is usable and a lot more solid than I could have hoped. 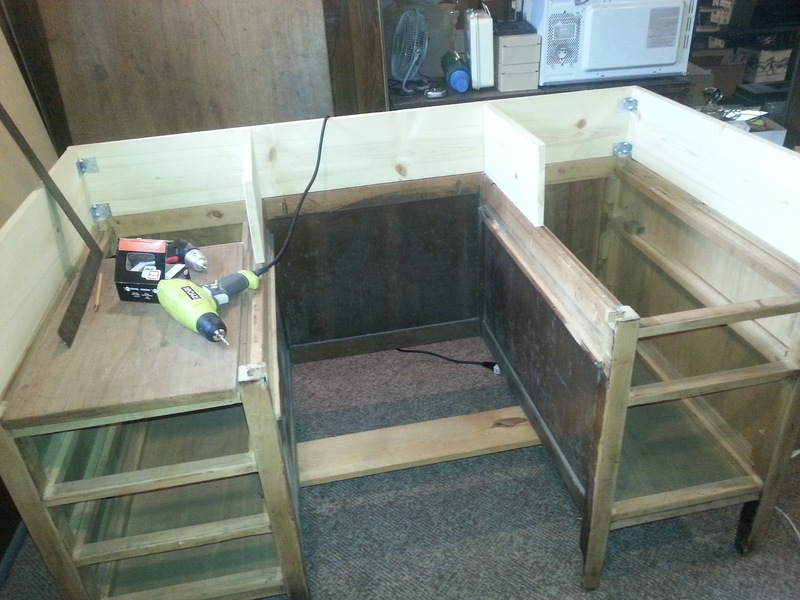 Thu 2 Jun 2016 - I cut down the center drawer and added a wooden brace to the front. 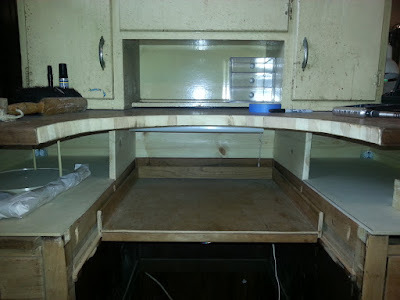 Then I mounted a small fluorescent light fixture under the bench top. Finally I attached a power strip to the side of the bench. Sweeps drawer and under-counter light. Frankenbench has electrical power, a tool/sweeps drawer, under-counter lighting, and it's in the intended spot in the studio. I've got the flex-shaft mounted and some tools in place.There may be some tweaks yet to come but for now it's ready for work. Time for a happy dance.